Lock in a great price for Gran Estanplaza Berrini – rated 9 by recent guests! I love this hotel! It's not my first time there... I always enjoy breakfast and the location is great! absolutely everything. employees very friendly and took a great care of us. definitely will stay there again. above and beyond our expectation. Very nice breakfast buffet. WiFi worked quite well but was somehow slow. The staff was very attentive and efficient at all times, room was comfortable and silent, breakfast was amazing! breakfast was fantastic and the staff was very friendly and professional. Excellent staff, very cordial. Bed and breakfast are amazing. Great location, great staff and excellent breakfast. As a frequent flyer, this hotel always make me feel at home. everything was lovely except the gym facility and the pool. they seemed a little dirty. Great Reception, Restaurant & Housekeeping staff. All 10/10. Management can be proud of the job staff are doing. Gran Estanplaza Berrini This rating is a reflection of how the property compares to the industry standard when it comes to price, facilities and services available. It's based on a self-evaluation by the property. Use this rating to help choose your stay! One of our top picks in São Paulo.Located between Berrini and Nações Unidas avenues, the 5-star Gran Estanplaza São Paulo offers luxurious services in an impressive building where classic architecture is combined with Brazilian décor. Spacious air-conditioned bedrooms offer a balcony with a view, mini-bar and flat-screen cable TV. Private bathroom comes with a hairdryer. A library with fireplace are also provided. After an eventful day, sit back and relax while savoring a drink at Estancafe. Two restaurants are available on site. 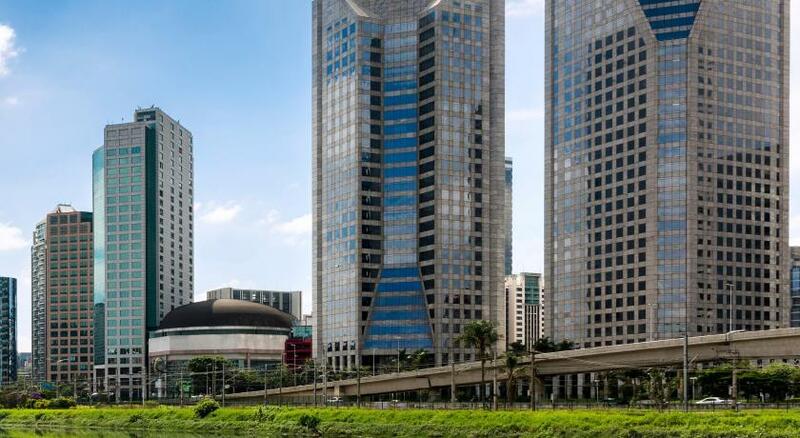 WTC Sao Paulo is located 1,000 feet from the property, while Morumbi Stadium is 1.6 mi away. Congonhas Airport is 3.7 mi from Gran Estanplaza and Guarulhos International Airport is 29 mi. When would you like to stay at Gran Estanplaza Berrini? This carpeted, air-conditioned room has a balcony with city views, a sitting area and cable TV. The private bathroom has a shower, free amenities and a hairdryer. This luxurious, air-conditioned suite features a balcony with city views, a separate living area with a sofa and cable TV with DVD player. The private bathroom offers a bathtub, bathrobe and free amenities. This suite includes access to the VIP Lounge, with special services on weekdays from 8:00 to 21:00. This 64-square yard suite comes with a living room and a bedroom with a queen-size bed. Air-conditioned, the suite features a balcony with a mini-bar and a coffee machine with complimentary supplies. The unit also has 2 29-inch flat-screen TVs with cable channels and a Blu-Ray player. The private bathrooms include a bathtub, hairdryer and amenities. This 140-square yards suite comes with a living room and a bedroom with a queen-size bed. It features a 29-inch flat-screen TV with cable channels, a Blu-Ray player and a balcony. This air-conditioned unit features a mini-bar, a coffee machine with complimentary coffee capsules and a private bathroom,fitted with a hairdryer, bathtub and bathroom amenities. This air-conditioned double room features a balcony with city view, a living room, cable TV and seating area. The private bathroom is fitted with a hairdryer, bathtub and bathroom amenities. This suite is located on a higher floor and it features a seating area, a bedroom and 2 terraces with city views. It also offers cable TV, air conditioning, mini-bar, telephone and a work station with high-speed internet, for an extra charge. Bathroom comes with a bathtub, bathrobe and slippers. Guests can also have access to the VIP floor. This suite is located on a higher floor and it features a a meeting room with a conference table for up to 8 people. It also offers cable TV, air conditioning, mini-bar, telephone and a work station with high-speed internet, for an extra charge. Bathroom comes with a bathtub, bathrobe and slippers. Guests can also have access to the VIP floor. You are our guest of honor to enjoy the delights of our gastronomy. Start your day with a complete Estanplaza breakfast. A selection of flavors divided into seasons: Farm Breakfast, Tropical, Health, Continental and Cuisine Show. House Rules Gran Estanplaza Berrini takes special requests – add in the next step! Gran Estanplaza Berrini accepts these cards and reserves the right to temporarily hold an amount prior to arrival. Please note that the hotel offers high-speed internet access for a surcharge. Reduced-speed internet connection is free of charge. Please note that room service is available 24 hours every day. A stay of a child or teenage below 18 years old is forbidden without parents or parents authorization joined by someone responsible with registered documents signed by the local authority. This is not a 5 Star hotel. Nice lobby and afternoon tea. To work at room it is not very confortable. Tha table has an old fixed fone on it and to plug my advices was terrible. It is an old hotel. The decoration I dindn´t like either, it is old. Missing coffee or tea machine in the room. Pool is terrible, elevators slow and no logic.... would be time for a little update to this great location hotel!! Didn't like the shower over bath but this is not dealbreaker. Great hotel for a business trip. Breakfast was really good. Staff friendly and helpful. location great to walk around explore local eateries in the evening. The breakfast was fantastic. The staff. So helpful. They make anything you would like. The restaurant, to be honest, it is 3-4 stars level. The wine is, not good enough. Neither the food. I asked a rare steak, but they gave me a well done......disappointed. Breakfast is nice and varied. However, not a single vegetable was available during my stay. Lots of sweets and cheese, yes. SP is a huge city, so make sure that location is ideal for your travels. Hotel is located in a nice and safe area walking distance to shops and restaurants. Room was huge and very clean with all facilities of a starred hotel. I did not use any of the amenities so I cannot comment on these. Staff is friendly and helpful. I can easily recommend this hotel. It’s just 5 stars hotel !